Hello again from Beer Church, the brewing group at Pumping Station: One! This past Sunday the 6th, we tasted & kegged a beer (the Doppelbock’s leftover batch, titled Kinderbock Son von Doppelbock), tasted our previous foray into Mead-making (I Didn’t Mead It That Way, and brewed an American IPA with Cardamom titled Putting the India back in IPA, all grain. It was an all-around great day and the ferment bucket for the IPA is bubbling along crisply in the fermentation chamber. 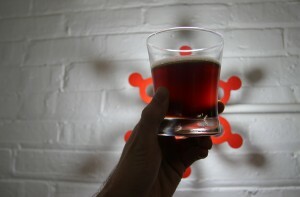 Today at N00B’s Paradise (Pumping Station: One’s event for newcomers), we tapped the Doppelbock – it’s good. Doppelbock, one of Beer Church’s brews. 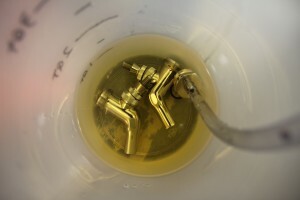 We just cleaned the taps. The bar is operational. We’re rocking and rolling. * Whatever bottle you bring! Find something in your fridge or the store that you think most people haven’t had, and introduce us to it. Another new addition to equipment is our BeerGun which we can now use to bottle beers. This and future brews will have a small amount taken aside for a limited run bottling. Part of that bottling run will be granted to those who took part in brewing of the beer; 2 bottles for the brewmaster and 1 for all the helpers who stuck around until the end. Of course, this doesn’t happen immediately; the brew has to make it through brew day, fermentation, maybe racking for secondary, kegging, kegging, and bottling first. This in mind, if you help out on brew day you’ll get something to show for your efforts that’s a little more solid than being able to come in and try your brew on tap. The rest of the bottles will be saved for future Beer Church events so we get to savor them for a little bit longer. Our brews tend to go by pretty fast after they go on tap, since they’re so good (so far). When: Sunday January 20th, 1PM. We expect to brew brewing until around 7 PM or so, but you don’t have to hang around the whole time if you don’t want to. See you on Sunday. Follow along at our twitter, @ps1beerchurch.